The peghead presents an opportunity to show off some creative flair. There are many attractive peghead designs out there and it is easy to come up with your own. All this aside, the peghead has a job to do. It holds the tuning machines and so must have room to accommodate them without crowding. Before I get my heart set on a design, I first consider how much room my tuners will require. There are several styles of tuners available commercially with varying sizes of shaft diameter and height. I like to get my tuners before I settle on a peghead design, just to check it all out and make sure of the dimensions. I have found that allowing the diameter of a 25 cent piece leaves plenty of room for most commercial tuners. 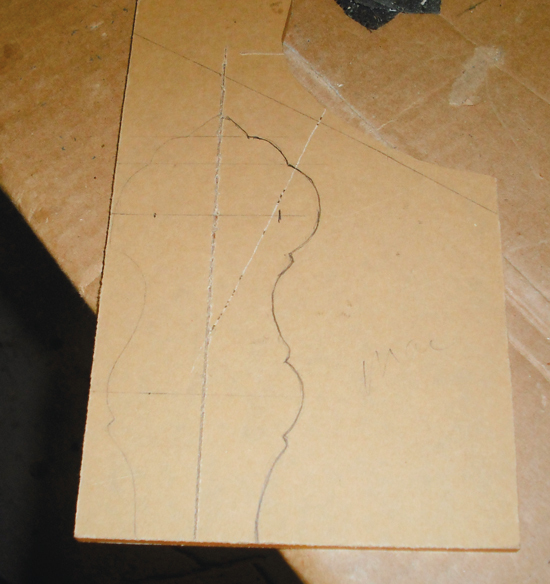 When I’m designing a new peghead I use the quarter as a layout tool to find a workable spacing for my tuners. After the shape is figured out, the design can be transferred to the peghead. When I have a peghead design that I really like, I make a traceable pattern from plexi-glass or cardboard like the one seen in the photo. Be sure to mark the centers of the peghead holes at this time as well. Later these marks will tell us where to drill the hole that the tuners will mount in. Making a peghead pattern from plexi-glass.